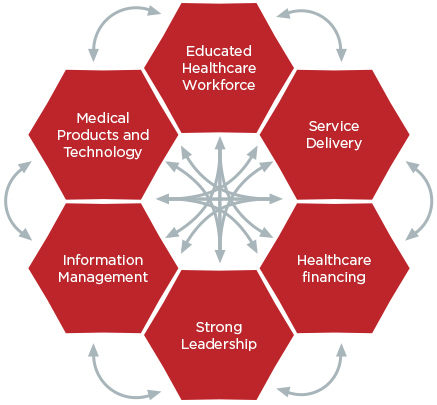 We view a health system as an interconnected web of elements. We recognize that each of these elements must be functional to enable effective delivery of care. In alignment with the World Health Organization’s Health System Framework, we address the key elements of the health system to deliver integrated solutions and improve the entire system. Our work is based on robust data analyses and informed by years of on-the-ground experience. We align with the Tanzanian government’s strategies and our local partners’ priorities. Our programs are implemented after coordinating with technical experts and securing private and public sector funding. We believe that international development should not foster dependency, but rather empower local communities to create sustainable change. As such, we work with Tanzania’s existing institutions, making substantial investments in building their capacity to train more healthcare workers and provide a higher quality of care. Once our programs are in place, we reduce and ultimately phase out our support, transitioning programs to local management and guaranteeing their long-term sustainability under Tanzanian ownership. Touch’s public-private partnership with United States Agency for International Development (USAID) has been integral to our work. Read a USAID blog post recognizing our health systems strengthening approach. Our staff have varied backgrounds, ranging from medicine to public health to management consulting.